Fiberlog | TChemGrrl's house of crafty blathering. Last year, and the year before last, I made the mistake of mixing business and pleasure, of taking crafts that I enjoy and friends that I like spending time with and putting myself in charge of stuff. It turns out that I am 100% incapable of handling that, of having stress in my fun time or of having fun during stress time, of disappointing my friends and myself over things that are supposed to be my happy place. It put me into a yucky avoidant place that took about 18 months to get through. Not past, yet, not really. But getting there. My job gives us the whole week between Christmas and New Year’s off, and I spent that time organizing the craft stuff. For the first time in a long time, sorting through the fiber, yarn, books, and long-abandoned projects filled me with pleasure and excitement rather than dread and exhaustion. At the end of the week, everything was in its place and I had about two dozen ideas for projects. 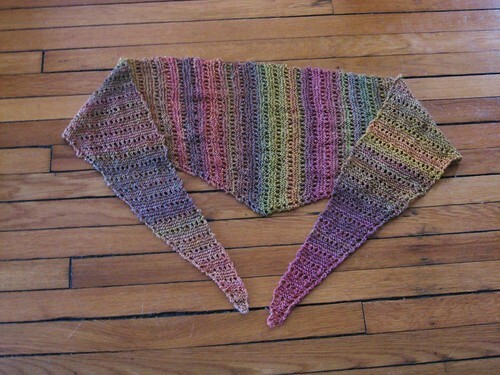 I finished a couple of easy-to-finish projects, including two shawls that literally just needed to be blocked. I ordered some things I need to do the minor finishing jobs on others. In chatting with my son about yarn and fiber, he asked if I could make a teddy bear for him, so we went on Ravelry together, found one with a face he liked, and I started working on it. I frogged some dreary projects and found new uses for the yarn. I cataloged the stash and made a note of some high-impact ways of clearing out some stash. I enjoyed the process. Which hadn’t happened in a long time. My goals for the year are to make more things, clean more things, volunteer for less, and to show my love through more, more conscious, actions. Sorry folks, disjointed sadness ahead. A craft friend passed away two weeks ago. Craft friends are a little funny–there are ways you get to know them, and ways that you don’t. Ruth was an incredibly generous maker of things; she was usually knitting, spinning, or quilting something for her kids or friends or distant relations, or doing finishing work for various people who would pop out of the woodwork. She didn’t keep much knitting for herself because she ran warm; even in the winter she’d be wearing a light shell. She recommended a book on tape series that I thoroughly enjoyed. She preferred teals and purples. She would always be the one to offer to help to hold a skein or untangle a yarn barf. On the other hand, I never laid eyes on her husband until the funeral. I had only the vaguest sense of where in town she lived. A bunch of the things I think of as friendship (at least, the college student and 20-something versions of it), we didn’t share. 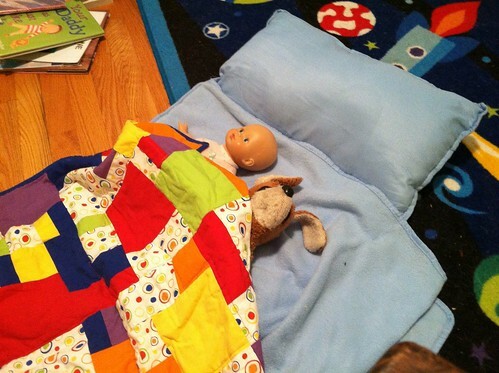 She made me a crib quilt when Theo was born. Of course she did. Bright cheerful blocks, warm but breathable and not too stiff, just the right size to move from baby cover to kid lap blanket. 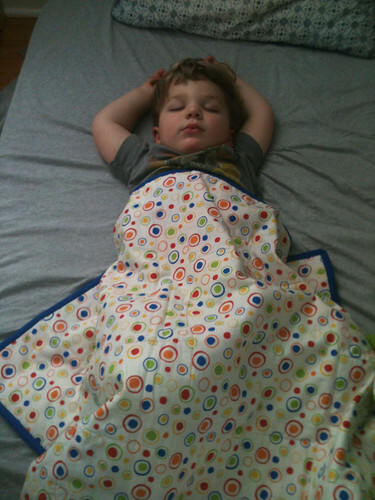 The quilting follows the blocks in erratic zigzags. I spent a lot of time looking at it draped over the crib in the dim predawn light while nursing, half-dozing, half-thinking about its construction. It’s been getting cooler around here (frost last night! ), and, thinking of her in hospice, I pulled her quilt out of the closet a few weeks ago. Not close friends, but craft friends. She wanted to keep everyone she knew warm and cozy and cheerful, and spent much of her too-short life working on that. There’s not much better way of showing love. The best way I can show my love right back is to keep letting her do that work, and thinking of her. I think her quilt is going to get a lot of use this winter. A number of common questions from both new and experienced spinners involves the use of those pretty, colorful braids of fiber that indie dyers sell. What do we do with them? How do we prevent them from turning to mud? How can I make it look the way it looks in my head? Over the next few weeks I’m going to work on answering some of those questions. Taken together, they should add up to a handy little workshop on working with a particular fiber. So this is kind of a funny way to define color-management; this is the sort of thing that someone would normally put with plying techniques. But it’s still super relevant. Chain plying. Chain plying seems to be the source of much Rav Group angst. It’s weak! It’s strong! I hate it! It’s the only thing I ever do to my yarn! It is technically true that it’s not a “true” plied yarn. 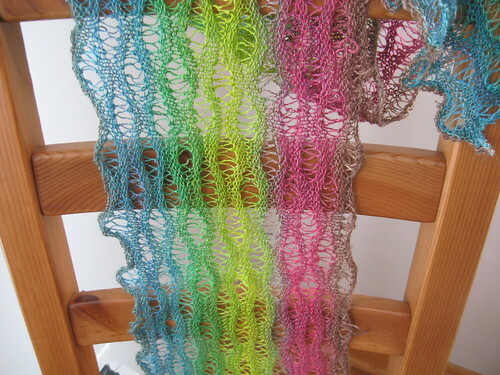 This technique involves taking one length of a singles yarn and creating large loops, similar to a crochet chain, and then adding twist. (Note: Chain plying is also called Navajo plying, as it was inspired by a technique that Navajo weavers use in making a corded edging on their weavings.) Youtube video with a wheel spinner, Youtube video with a spindle spinner for examples on how actually to do it. It’s lovely, but it would be difficult to get the colors to line up without doing more organization than I was interested in doing. I spun up all the singles in one continuous go, and then chain plied the singles. I’ve just shocked myself because I don’t have a picture of the final yarn here (I ALWAYS document! That yarn as been in my stash for AGES!) but I do have a picture of this little swatch, which shows two things. 1: The colors are lining up with each other, because each segment of chain-plied yarn is composed of singles made of the same bit of fiber. 2: Chain plied yarn doesn’t actually explode on contact with knitting or anything. Here’s another example. I’ll be talking yet more about fiber splitting later and bring this sweater up again, but for now, suffice it to say that my goal was to spin a yarn where the stripes on the sleeves were about the width of the stripes on the body. I wasn’t quite ready to go whole-hog of splitting each smaller piece into equal pieces and getting them to ply together correctly (if memory serves, I started this project while at a fiber festival and wanted to just spin, without a ton of access to scales and laying things out into little baggies and such.) I split the sleeve fiber into narrower pieces because the knitting itself was narrower, I needed less yardage per stripe. And then I just spun and chain plied so that I didn’t need to concern myself with getting a bunch of singles to come out perfectly. If you look closely you can see a few of the little lumps formed by chain plying. But look, the yarn didn’t explode! And the stripes came out kind of equal! Okay, so there are some downsides for chain-plied yarn. The workflow is totally different than making a more traditional plied yarn, and personally I find it a pain in the tuchus and avoid it unless I have a particular effect I like. But some people hate more traditional plying and love chain plying. So play with it a bit before you decide. The transitions between stripes in a chain-plied yarn are somewhat harsher than they would otherwise be, lacking the soft in-between section that occurs when the colors in a normally-plied yarn do not line up perfectly. I usually LIKE that softness–if I want hard stripes I’ll just use multiple yarns–but you may have a colorway that looks ugly when barberpoled. The jury is out as to whether chain-plied yarns wear as well as their more traditionally-plied counterparts–the spot where the chains intersect does appear to be a weak point on the yarn itself, but no one agrees on how much effect this has on a knitted fabric. The fact that the argument exists leads me to suspect that the differences in wear are negligible in practice compared to the effects of fiber, singles twist, and plying twist. It is true, though, that variations in thickness are not masked as well as they are in a traditional plied yarn, and this may affect your wear, if your spinning is not very consistent. This is more noticeable if you’re someone who tends to drift in thickness from session to session *raises hand*, less so if your inconsistencies are on the foot-or-less scale. I also think this is a good way of keeping like colors together if keeping track of fibers and weights and stuff is irritating to you. Which is why a lot of people use this technique, I think. But I wanted to use the baby sweater above to point out that just because you’re chain plying doesn’t need to mean that you turn your brain off completely. You can still do interesting things with splitting the fiber. Precise definitions vary, but the primary technique in fractal spinning involves spinning a multi-ply yarn where one or more plies have shorter color repeats than one or more of the other. For example, in a two-ply yarn, the first ply is spun from the full thickness of the fiber, and the second is spun from the fiber split into quarters. Within every “stripe” formed by the first ply, there will be four “stripes” formed by the second. The overall effect tends to mute the original fiber, but still maintains a more cohesive and unified look than spinning completely at random. It gives may colorways a somewhat “shimmery” look, as every color combination within the fiber ends up happening somewhere in the final yarn. Personally, I also find the preparation more straightforward than the stricter requirements for getting the component singles to line up perfectly. When I just feel like spinning without a lot of forethought, this is the technique I most often turn to. Break the fiber into two or three equal pieces, split one or more of those pieces into two or more strips, spin each piece separately, and ply. 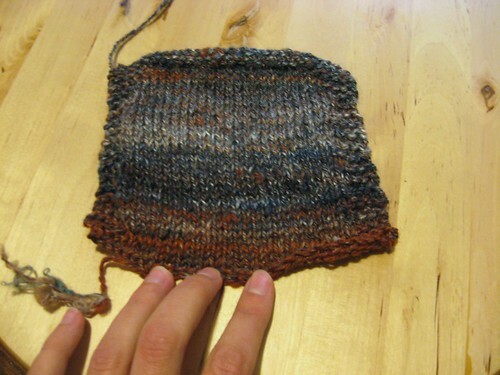 Downsides: This technique maximizes the chances of all colors interacting with each other; if there is a combination guaranteed to turn to mud, you will probably see it somewhere in the yarn. If there’s a mix you absolutely HATE, this is probably not the technique for that fiber. Personally I’m not much of a fan of making a fractal yarn from a saturated non-tonal yarn. 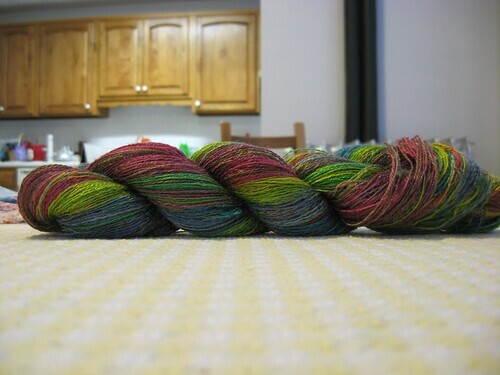 I think in more washed-out colors, the muting effect works, and I think that in muted or bright tonals, it works, but I wouldn’t use it on a bright rainbow-dyed fiber. For more information, refer to the Summer 2007 issue of Spin Off, which has an excellent article on this technique, including many examples. 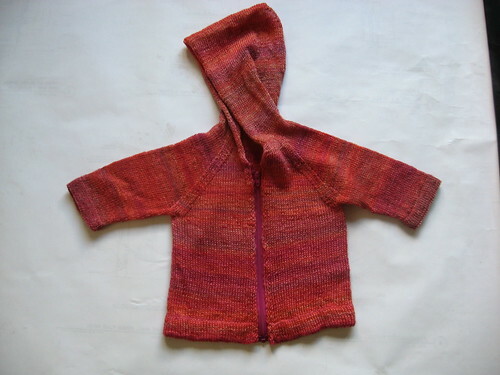 The child’s sweater is a 3-ply fractal spun from a vibrant pink-orange yarn. One ply was not split at all, the second ply involved top split into 1/3rds, the third ply used top split into fairly thin pieces. The colors are considerably more subtle than in the tonal fiber. When worn it looks pretty darn pink, the striping can only really be seen up close. Traditional rolags are made of carded fiber rolled into a tube and spun perpendicular to the direction in which the fibers lay. Lazy rolags look similar and are spun the same way, but are made from pieces of commercial top, broken into staple-length chunks and rolled across the grain of the top. This arrangement makes it easier to spin an airy woolen yarn from commercial top. It’s a particularly nice technique for short or slippery fibers. Downsides: If you want a smooth dense yarn, this may not be the technique for you; we are seriously disordering the nicely aligned top! The next few entries are going to talk about fiber management tricks. They’re all going to employ a fair amount of what I’m going to call splitting and breaking. So, time to define some terms. 2) You want multiple plies with colors that will line up closely (see other techniques below for more options on achieving this goal). In this case, you will want to split the fiber as evenly as you can. A scale that can weigh to grams or tenths of a gram is useful for this. When I am doing this, I typically break (see “breaking”) my fiber into 1-ounce pieces. This way, if one piece ends up slightly heavier in the first ounce, I can make up for it by using the lighter piece in the second ounce. Over the course of the yarn, small areas of barberpoling serve to soften the transitions between colors. I like this effect, but if you don’t, you can break the singles and rejoin where the color of the singles is perfectly aligned. 1) Someone told you to and you don’t know why. Honey child, just try it. 2) You have a hard time managing more than a skinny piece of fiber at a time. If this describes you, I’d really encourage you to work on the fiber management skills that will allow you to get what you want from any sized piece of fiber. Having the option to do something means that you can choose to do it or not to get a particular effect. It’ll give you a lot more choices. -Well-prepared top has its fibers perfectly aligned, and this order can be disarrayed by the process of splitting the top. I have seen other spinners report differences in their yarn; I haven’t seen it personally, but I don’t usually work on the extreme worsted end of the spectrum. In any case, it’s worth a mention. 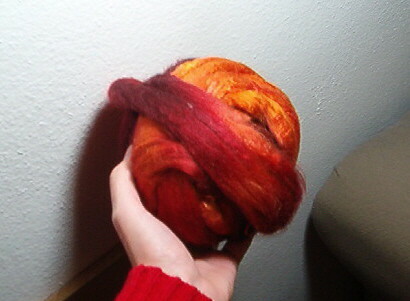 -The preexisting misalignment of fibers makes this a difficult technique to achieve in a carded roving, though true rovings are rarely found in a space dyed form. This refers to tearing off pieces of top or roving perpendicular to the “short” direction of the long piece of fiber–against the grain of the fiber, in top. Hold your hands at least one staple length apart and pull until the fiber has come apart. 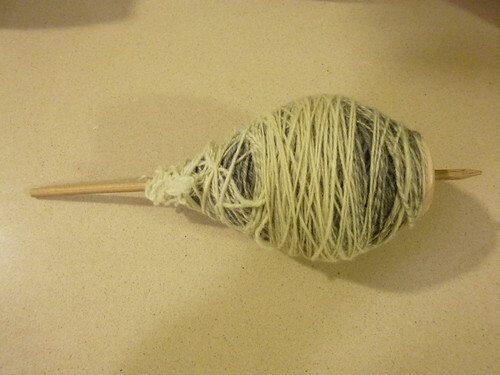 You may want to break the fiber into a shorter piece for ease of handling, or when spinning from the fold. Downsides: Breaking the fiber to manage the color will be less effective when the blocks of color are shorter than one staple length. Other things to consider: As a color management technique, you may want to use it to change the order that the colors appear, or to remove a color that does not appeal to you. I have done this with a lively pink-orange colorway with a just a bit of dusty purple that did not appeal to me. I simply removed the purple and set it aside for another project. You can also completely reorder the colorway. In the example below, I wanted to maximize the mixing amongst the colors available. 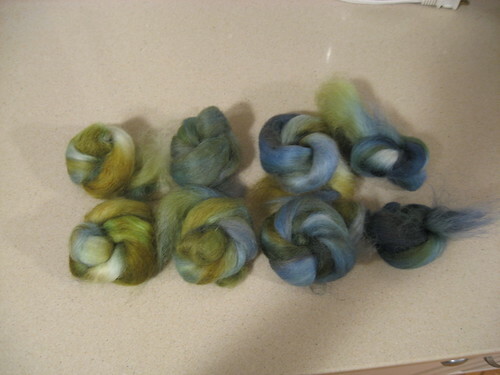 The fiber has light blue, dark blue, green and brown in roughly equal amounts. I broke the top at every color change and put the colors into 4 groups based on color. I’ll spin each color into one ply of a 4-ply yarn. A similar technique could be used to make stripes longer than would be possible from spinning the full width of the fiber. Okay. Go pick a theoretical fiber from the stash or from a fiber seller whose stuff you like. 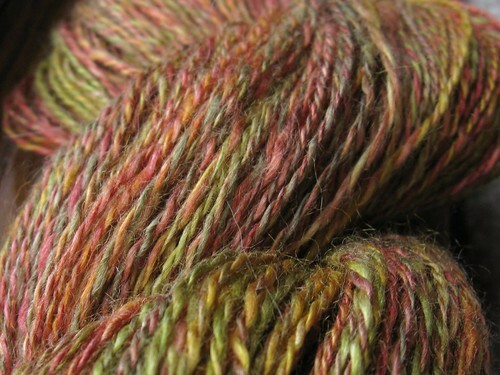 We’re going to talk about how to get the colors you want out of the fibers you have. Let’s start with the color wheel. This terrible, made-in-5-minutes-in-Powerpoint color wheel. Shhh. You know what color wheels look like, this is just a quick reminder. If your goal is a yarn that closely reflects the colors you see in the fiber, then the technique you choose to spin your fiber will depend on not only the properties of the fiber, but of the colors in it. In general, colorways that contain colors close to each other on the color wheel (or tints, tones, or shades as in in the image above) are likely to blend with each other in a way that looks much like the original fiber. 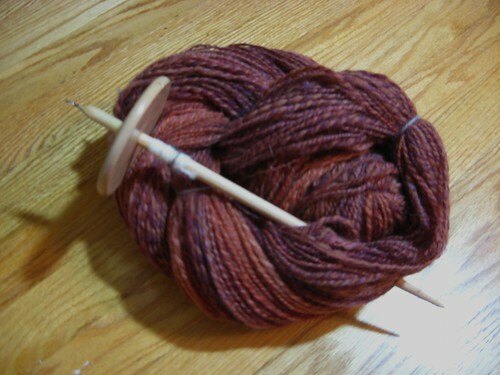 In other words, a colorway of orange, red-orange, and burgundy such as in the fiber below will likely read as a similar reddish colorway as fiber and as a finished object, regardless of the care taken in lining up or mixing the colors. If you don’t want to spend a lot of time managing fiber, sticking with these “color family” colorways is a good way to do avoid surprises (pleasant or unpleasant). The fiber, yarn, final project in a tonal yarn where the colors were intentionally mixed are seen below. The overall impression of reddish fiber/yarn/scarf is maintained throughout in spite of the mixing, and this is largely due to the fact that the individual colors are neighbors or near-neighbors on the color wheel. The example below shows a non-tonal colorway in which the colors were spun to minimize mixing. Note that the handspun yarn and the final project contain similar very bright and distinct blocks of color which were preserved from the original fiber. Unfortunately I don’t have a picture of the original fiber, but you can see from the closeup that it contained pink, apple green, golden yellow, and a bit of grayish-green. 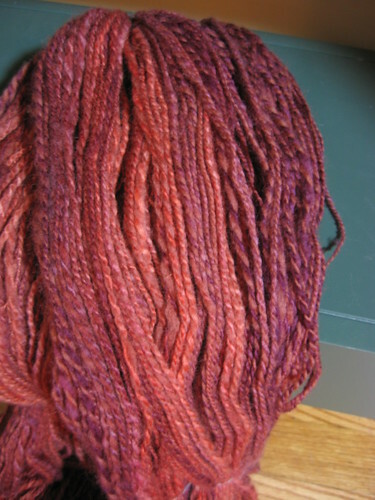 The fibers, like the red ones, were spun in a way that allowed for a lot of mixing. The effect, however, is quite different. The point I wanted to make in this section is that the effect of contrasting colorways mixed together does not need to be unpleasant and “muddy” (I’ll talk more about how to avoid an overall muddiness in a future entry). 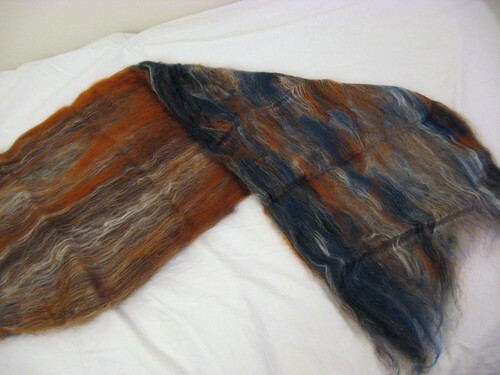 Part of the fun of working with dyed fibers lies in finding out what the final result will look like! It’s a useful exercise to take some notes prior to spinning and then actually turn your yarns into projects, so that you can determine which of these effects to use for a particular project. 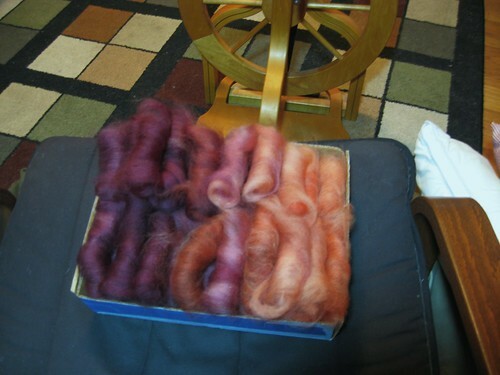 Most of my craft-time lately has been taken up with teaching a beginner’s spinning class and a few one-on-one classes. I had a great time, and hopefully the new spinners did too! I always have grand plans of taking pictures, but if you’ve seen me do educating in person you know that I get a little, um, focused, and that stepping back to take some casual pictures is just not possible. that was the past month. Right now, I’m working on a project that I hope to publish, so I have very little that I can show. But I’m excited about it, and my plans are working, so that’s always good. 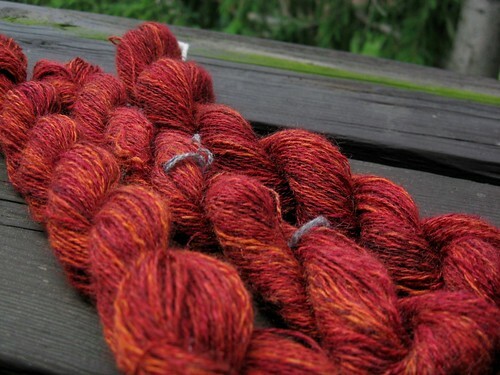 In the mean time, I thought I’d put together a few posts on handling hand-dyed fibers. A number of common questions from both new and experienced spinners involves the use of those pretty, colorful braids of fiber that indie dyers sell. What do we do with them? How do we prevent them from turning to mud? How can I make it look the way it looks in my head? Starting point: What do you have? The starting point in working with a hand-dyed fiber is going to be very similar to how one would look at a solid color fiber. If you are not an experienced spinner, are not willing to spend money on a fiber mistake, and are not able to see fiber in person, I’d STRONGLY recommend starting with fiber from a known good dealer and not the first person whose results pop up on Etsy (whoever that is today). There are many recommendations on threads in Ravelry and in my How to get started with spinning post. In-person starting points: Confirm that the fiber looks okay, not too compacted, not sticky to the touch. Merino top is particularly notorious for getting felted in inexperienced (or having-a-bad-day) hands, and the airiness of a carded roving sometimes gets squished into oblivion by careless dyeing. Check that the dye goes all the way through the chunk of fiber. Spinning is a bit different than knitting and spinning in that you have a bit more control over the final product from this point–the same braid could be a delicate lacy shawl, hard-wearing socks, or a smooshy hat depending on how it’s spun. While you’re checking out the fiber, think about the questions below. They don’t all need an answer immediately, but looking over them may help you to narrow down your options. If you can’t decide between two things that both sound intriguing, don’t be afraid to sample and swatch a few ideas first! Color: What kind of colorway is it? Is it tonal, or are there hues from every corner of the color wheel? 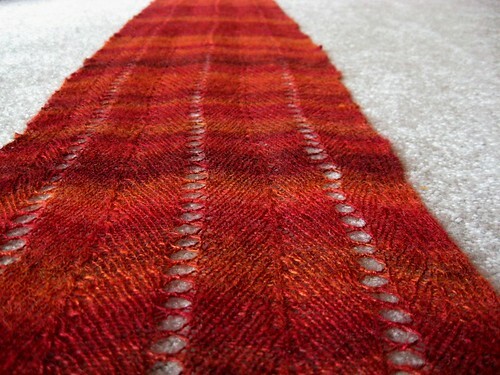 Would you like to tone the colorway down somewhat, or do you want the final project to look exactly like the fiber? Are the blocks of color very short or very long? 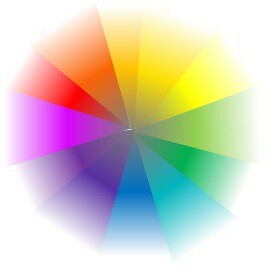 A 5-minutes-in-Powerpoint color wheel, which I will be referring back to later. The final project: What kind of project do you want to use it for? Would long stretches of color or shorter ones be more appealing? Do you have enough fiber to complete your planned project or would plying with another fiber help you to stretch what is available? Yarn structure: Would singles or plied yarn be more appropriate to the color and project? Which would be better in terms of wear, etc.? Would a fluffy, airy yarn or a firmly twisted, hard-wearing yarn be better? 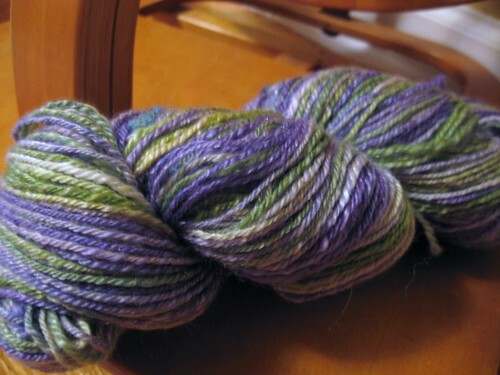 Personal Preference: Do you want to pay a lot of attention to the yarn as you spin and/or ply it by weighing, measuring, swatching, etc, or do you just want to go with the flow? Do you mind spending a few minutes prepping fiber? Will you be sitting with your wheel in one place so that you can lay out some pre-planned fiber and grab pieces easily, or will you be moving around with your spinning a lot, making such organization difficult? In upcoming posts I’ll be talking about some of these options in more detail. I got a smartphone, that’s what happened. There are some good things about it–my mom got one at about the same time, and talking face-to-face has been pretty cool. And yeah, it is handy to look up the hours of a restaurant as we’re headed downtown, and decide to go somewhere else for dinner instead. And it’s nice to not be openly mocked for my phone. But, um, the last 3 months kind of fell into a little screen. I’m getting better at setting it down, but still not great. You see, this is why I’ve lived a damn near close to straight-edge life, my whole life. There are plenty of addictive behaviors in my family, and the best way to avoid stepping over the line seems to be to keep the line so far away that it’s not even visible. And now I have this little addictive-behavior-promoter and it is not healthy, people. So this was a bit of a funny yarn. 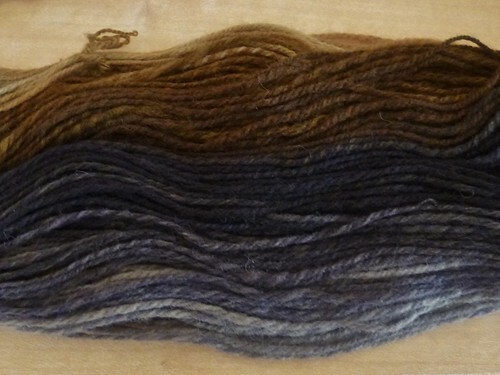 I got this gradient-dyed fiber from my local knitting shop a while back when I was there to give a spinning demo. (It’s from Wild Hare Fiber, whose fiber I’ve really enjoyed in the past.) Just grabbed it 5 minutes before showtime, and sat working on it for most of the afternoon while answering questions and demonstrating things. 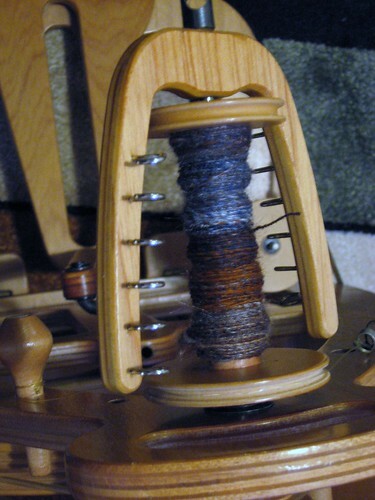 By necessity, I spun it in my most automatic possible way for a wheel, with very little thought as to its final application–I split the fiber into 3 equal pieces, spun it at a thickness to make a 3 ply sport-or-so weight, and plied it. I plied the yarn on the hookless bottom whorl spindle I got in a recent class of Abby Franquemont, because I wanted to get some good practice with her amazing flying trapeze of a plying technique. I found that flicking the spindle shaft between my palms with the force required to make everything happen bruised my hands a little, particularly as the spindle filled up, but with experience (and callouses), I could see using it a lot. Getting twist to move at great speed without tangles is definitely a rush. 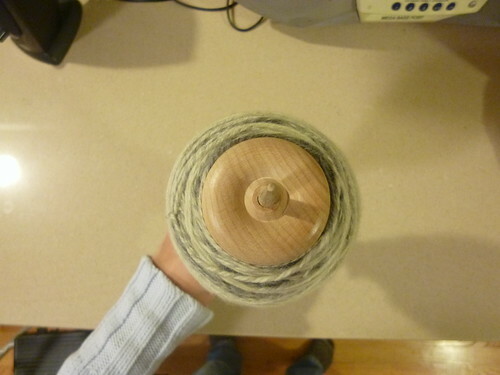 And just look at how crammed that spindle is! As I was working on the singles, I got to thinking about what I could do with it. 4 ounces isn’t enough for a large project, but the slow gradient from white to black and back to white was the sort of thing that seemed to want a larger-scale canvas. 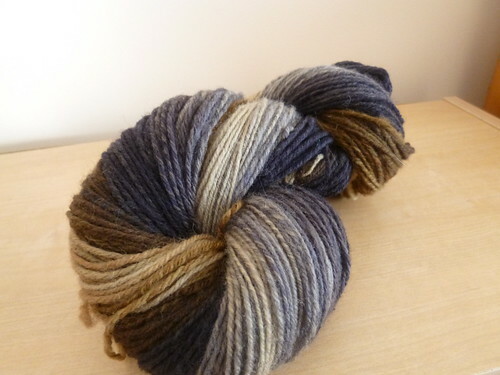 I thought about the handspun color shifts in my Huntington Castle pullover, and had the thought that doing colorwork using this yarn on a white background would be really interesting. 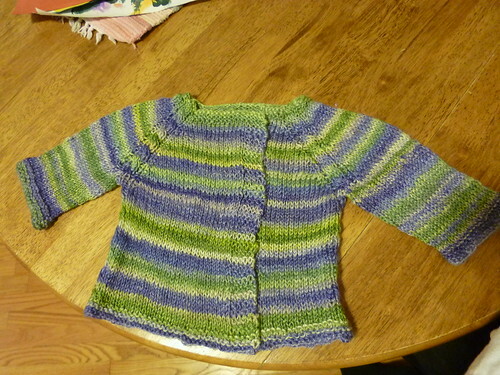 The starting and ending color was white, so the colors would just sort of slowly appear and disappear, a knitted Brigadoon. Cool idea! I got excited about it, started deciding on a white fiber that would work well as the main color. The part of this I didn’t think through was that there was white fiber and there was dyed-black fiber, and that when they got washed the dyed-black fiber just might affect that white fiber. The final yarn is perfectly nice, but it doesn’t start with the white color, which throws off the plans. So now I don’t know what to do with it.